Before you approach Kirk McGuire Bronze Sculpture you may want to answer these questions yourself so you are able to clearly convey your expectations. • What size would you like your sculpture to be? You may provide the size in measurements, such as 3 feet tall or 5 feet long, or in relation to the object such as life sized or half-life sized. • What is your budget? Be honest with yourself and Kirk. If your budget is tight let us know. We may be able to work with you to let you know how to decrease your costs. • What is your deadline? If possible, make available photographs of the subject to help the artist determine the level of detail needed. This will also enable Kirk to give a better estimate. Kirk will give you a quote for the final sculpture. The quote is an in-depth explanation of what the client should expect and will receive as an end product. The quote also includes the estimated cost which is determined by a sculpture’s unique configuration, size and proportion and, therefore, varies for each piece. You may take some time to consider the quote. The timeline, however, is based on the foundry’s schedule so consult the artist on exactly how long you have to decide without affecting the timeline and pricing. Note for large sculptures (i.e. life-sized, large than life): A finished maquette of the approved sculpture is required to calculate the cost of the bronze. The foundry must be consulted and requires accurate measurements in all dimensions; height, width, depth, direction/movement of the piece as well as other factors to be able to calculate the total cost. After accepting the quote, a down payment of 1/3 will be paid and work will begin on the sculpture. Kirk may ask you to provide photos of the work you want him to create, from the front, side, three-quarter, and back views if possible. Kirk may also take photographs and measurements to assure accuracy, or use his own research photos and film for reference. For large sculptures, a 2-foot maquette will possibly be sculpted before the actual size sculpture is created. Client review of the clay sculpture/drawings if created, a second sitting will be scheduled to help the artist put the final touches on the piece. Once the client has approved the clay sculpture/drawings, the second payment, equaling 1/3 of the total cost, is due to the artist. Once the sculpture is complete, the final 1/3 payment of the remaining amount of the quote is due to the artist (Kirk) and the finished artwork is given to the client. Arrangements will be made with the client for shipment, delivery or installation as indicated in the contract. If the sculpture needs to be installed, necessary professional installers will be employed and the artist will oversee the installation process. The cost of the installation is calculated separately and added to the initial quote. Now you understand the sculpture commissioning process. Please keep in mind that the process may vary slightly because each piece is unique. Also, it takes several months to complete a sculpture, so please allow at least six to nine months for life size statues and a year or more for larger than life pieces. There are variables to consider Kirk always works to make the best finished sculpture possible. He has worked with bronze foundries for over thirty six years and has a deep understanding of the entire process start to finish. If you are ready to commission your own sculpture, table, or monumental creation please contact me. 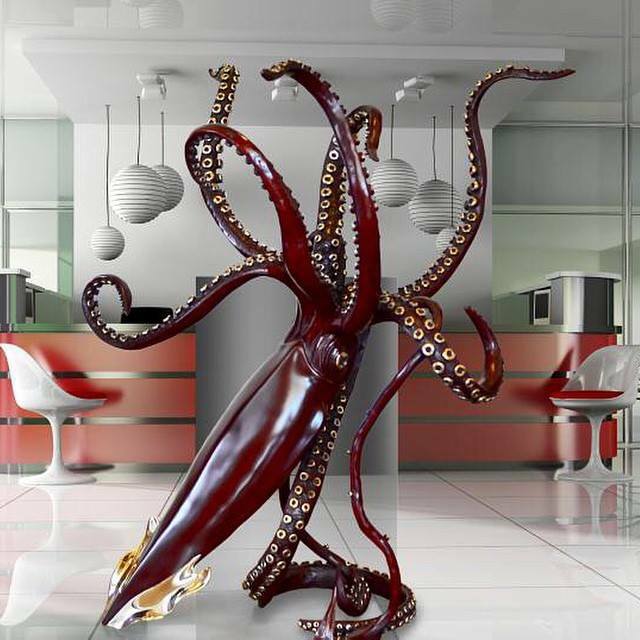 Commission a 'One of a Kind' sculpture, table, or large installation for your home or business.